Below is a story from one of our supporters in West Cornwall, about her cat Georgie's journey from Peterborough to a life by the sea. "I just wanted to share with you a little of the life of our cat Hector George ( Georgie ) as we now call him. 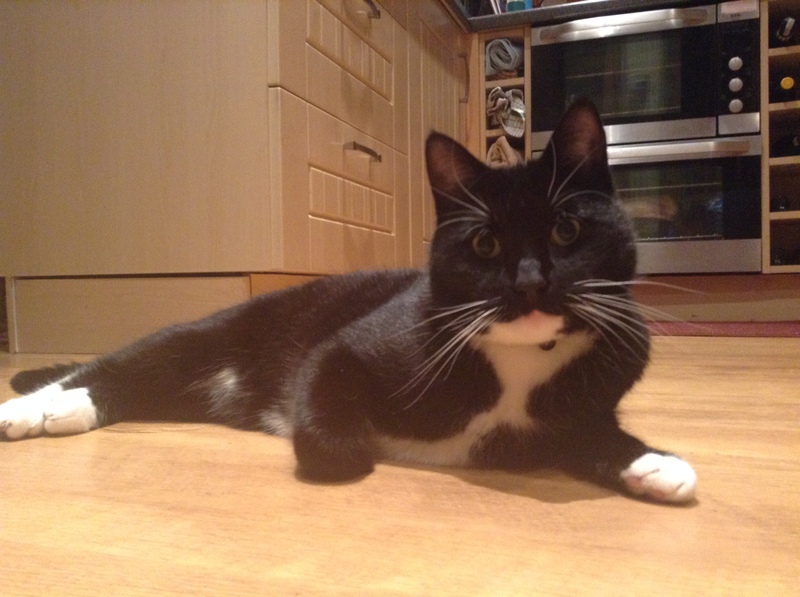 "Now Georgie, aka Perrin, Reggie and sometime Tux, as names were sifted through in his early days, came to us from Peterborough Cats Protection just over 3 and a half years ago as a very tiny, sweet, little black and white kitten. He arrived at your centre along with his mum and 2 sisters. "We had been vaguely looking for a black and white female kitten for a while as black and white cats have figured throughout our family life ( in 40 years we have had just 2 both female each living for approx 20 years ) and we were feeling kind of incomplete without one. "When my husband received a photo from a colleague at work of a family of black and white kittens that had been taken in by Peterborough Cats Protection we just were so taken by it. We spotted "the" one that we just knew we had to get. So, in spite of the fact that we lived 300 plus miles away in Cornwall and that the kitten we set our hearts on was a "he" and not a "she", as the family traditionally favoured, we were in no way daunted. "My husband then undertook the mammoth task of collection and delivery. A colleague kindly collected Georgie from Peterborough bringing him to my husband's workplace at the time which was in Hertfordshire. The transfer from car to car was made successfully and so with that part complete this tiny V.I.P. bundle of fur in an extremely large cage so embarked on the long trip home to Falmouth in Cornwall to begin his life by the sea. On the back seat of a large black car sat an imposing cage containing one very tiny bundle of black and white kitten. It was a great relief to my husband that the "bundle" turned out to be a model passenger and slept throughout the very long 7 hour journey. "Well , that was 3 plus years ago now and whatever worries about departing from the trend for female black and white cats in our household have completely been overridden. "Georgie has grown into a great big ( yes, I mean big!) daft, softie cat who always wants to make his presence known especially by landing across the dining room table, or any other table come to that, and sending any items flying in the process. He has a lovely character and is a fine specimen of cat; pretty handsome too and loves company especially when there is a place to sprawle out and display his fine physique. "With best wishes and many thanks for playing a vital role in Georgie's early weeks."